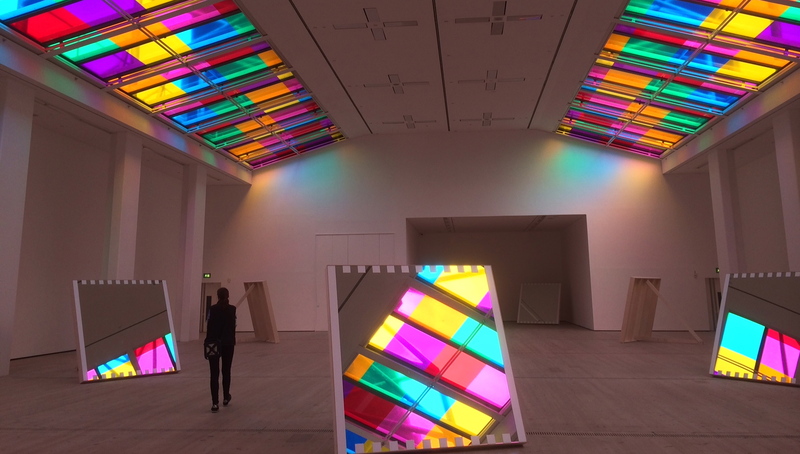 It is easy to think of Daniel Buren simplistically as the ‘stripe man’. Whilst it is useful for some to remember, and others to denigrate Buren by reference to his trademark wide stripes, there is of course much more to his art than that. As France’s leading conceptual artist he has punctuated the past 50 years with unforgettable interventions, controversial critical texts, thought-provoking public art projects and engaging collaborations. 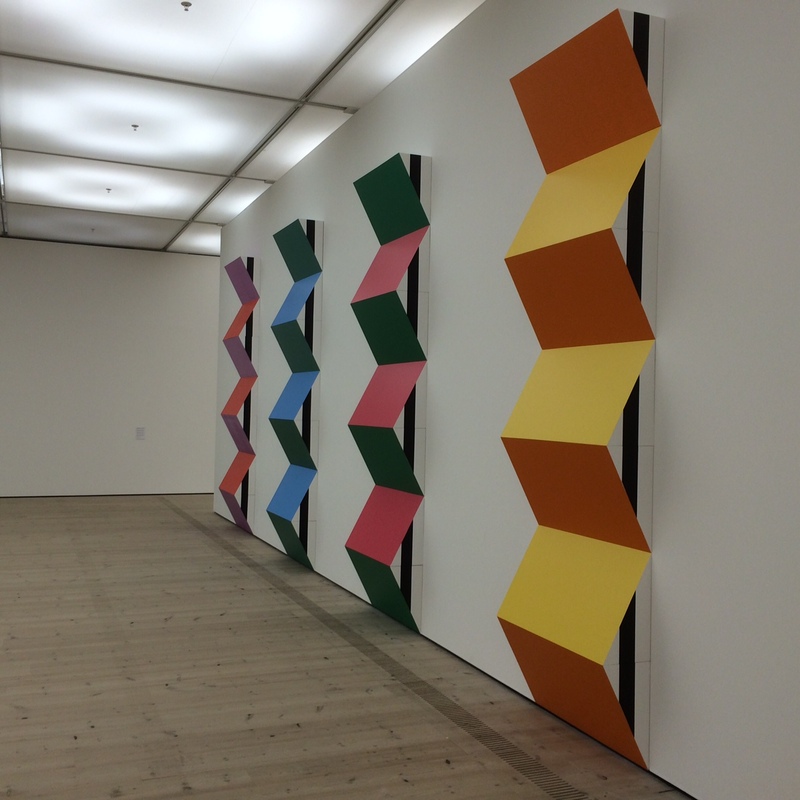 In the sixties Buren developed a radical form of conceptual art, a ‘degree zero of painting’, creating works which drew attention to the relationship between art and context. Abandoning traditional painting he adopted a wide vertical stripe, used as a ‘visual tool’ to prompt a reading of the work’s surroundings as well as just the work itself. 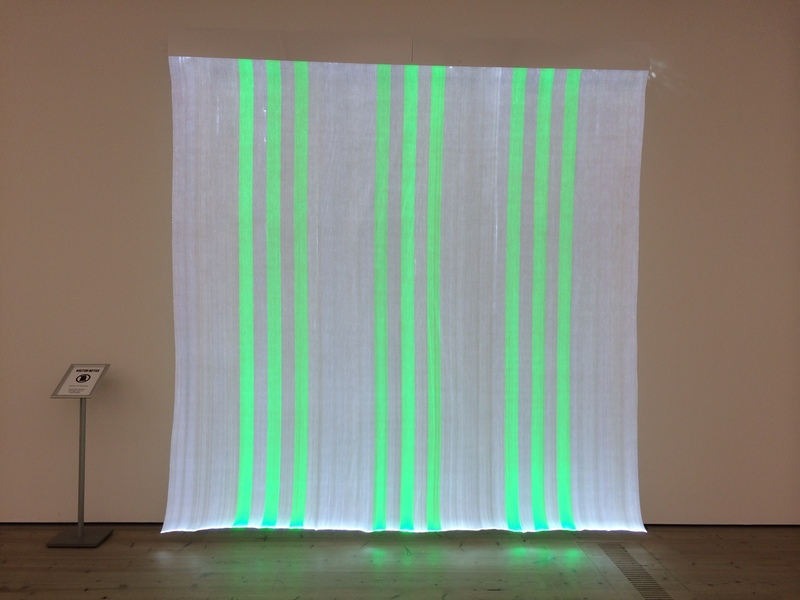 The stripes were variously made with paint, fabric, paper and tape often appearing outside the formal gallery space, made in situ, and responding to a particular location whilst appropriating and colouring the space . 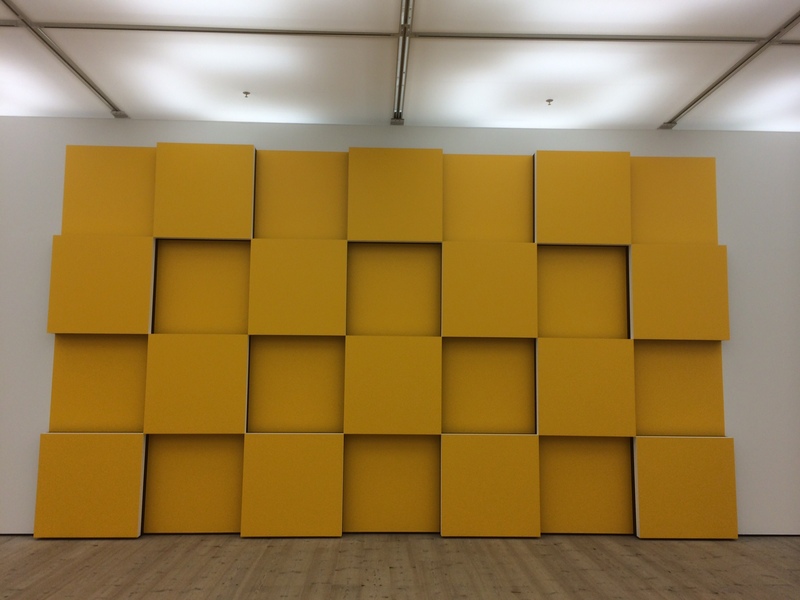 For his latest exhibition at the Baltic Centre the work is best considered in two parts. In the level 3 galleries it is easy to see the development from his earlier, simpler work. The strong colours remain but here are not only stripes but geometric arrangements whilst their structure has also become more sculptural and architectural. Fibre optic works from the Electric Light series unfurl down the walls, glowing sensuously. There are a selection of reliefs, paintings and sculptures which bend, zig zag or form 3D reliefs cleverly playing with depth, surface, colour and architectural space. 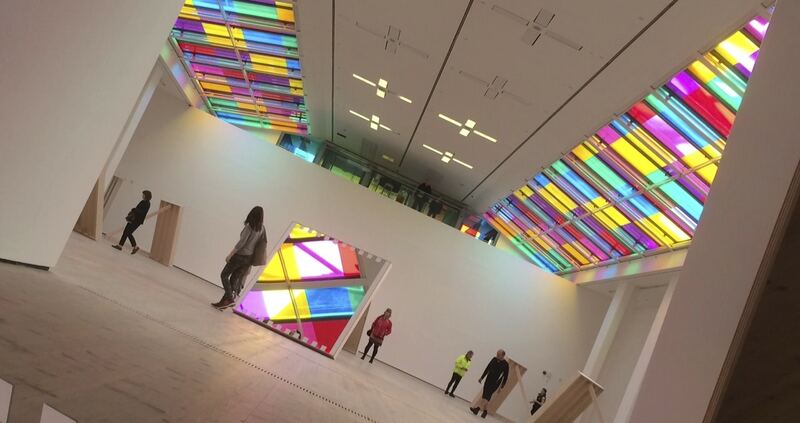 Arguably better still is the second part of the exhibition – a large-scale commission for the Level 4 gallery where Buren has coated the expansive skylight windows in geometric ‘gel’ panels of seven different colours. The whole space has effectively been appropriated as an architectural canvas for the projected light. A giant kaleidoscope if you like. To heighten the effect a series of angled mirrors have been propped around the floor casting light throughout the space. During our visit the sun popped back and forth from behind scudding clouds and alternately added even more colour to an already vivid display. One can imagine changing effects and sensations throughout the day. 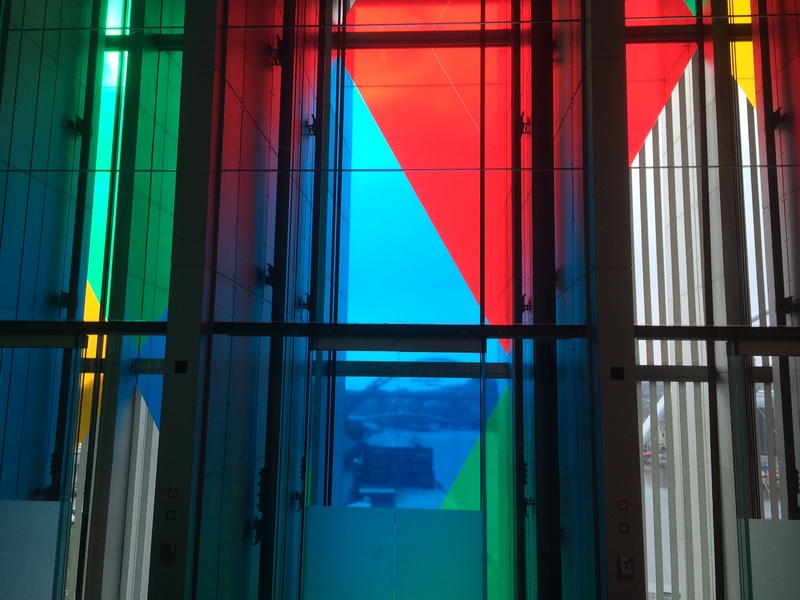 Further coloured panels were also commissioned for the front of the building with a varying effect either from outdoors as you approach the space or indoors – in particular riding the glass sided lift past the arrangement.